In December, London mayor Sadiq Khan declared a climate emergency at the unanimous request of the London assembly. The assembly calls on Khan to do 'an urgent updating of his carbon reduction targets to make London carbon neutral by 2030'. It is only eleven years to 2030 and transport is Britain&apos;s largest source of greenhouse gas pollution. There is no time to wait for new technologies to be developed and proven in service. London is already introducing electric buses that charge when stopped, but only on the least demanding routes. The biggest benefits for climate and regional air quality come from switching the longest, fastest and busiest routes to electricity. The good news is that battery trolleybuses are ready to replace diesel buses. Battery trolleybus technology is well proven; the system in Rome has been in operation since 2005. It is tempting to think that a climate emergency program could see large numbers of new tram lines built quickly. However, most urban roads cover an array of pipes carrying water, sewage, gas, and storm water that have to be accessible for maintenance and repair. (Tearing up tracks every time an underground pipe springs a leak is not much of an option.) It can be very expensive and disruptive to relocate pipes so tram tracks can be built. It is not just the financial cost that needs to be considered, digging up and replacing pipes, and laying heavy concrete beds for steel rails creates pollution. 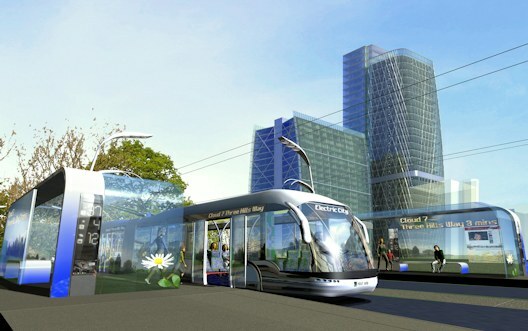 This is where battery trolleybuses could be a game changer. Not only are they cheaper and quicker to introduce, they only need overhead power infrastructure on a fraction of the route. Car traffic quickly expands to fill expanded road space in urban areas. And the opposite is also true; when you make a car lane into a bus lane traffic disappears. And traffic speeds don't usually change much. In her 1961 classic The Death and Life of Great American Cities, Jane Jacobs wrote about how after the road through Washington Square Park in New York was closed to make it a safer and more pleasant space 'cars - just disappeared into thin air'. Traffic did not increase on the surrounding streets as many had predicted. Many similar experiences of disappearing traffic have been documented. Any serious climate action plan must include measures to reduce car travel. And one of the most effective ways to cut vehicle miles travelled (VMT) is to re-allocate road space to anything other than vehicle travel or parking. Creating pedestrian streets, protected bike lanes, tram lines, or bus lanes all reduce VMT and the resulting greenhouse gas (GHG) pollution. But bus lanes for electric buses are an obvious choice in a climate emergency. A well designed bus lane can carry ten times as many people as a lane of cars, and make many polluting automobiles disappear, for a very modest cost. Modern trams are long vehicles with two or more articulated sections. Most of the buses used in bus rapid transit (BRT) lines are similarly articulated or double articulated 'bendy buses' with capacities of up to 220 people. Double-decker buses, and standard buses, are also used on some BRT lines. New battery trolleybus lines are also being installed for BRT lines. Bus rapid transit utilises bus lanes, typically in the centre of the road, and other features to make bus service faster and more convenient. 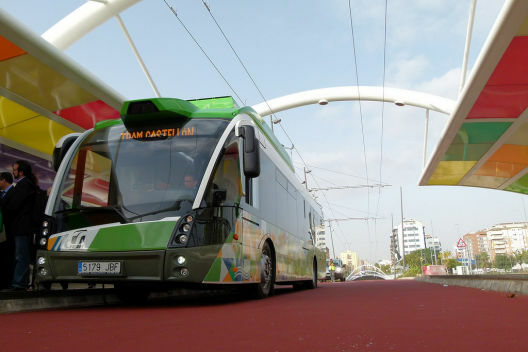 I recently test rode the BRT line in Castellon, Spain, which is about ten years old. The quiet electric buses run connected to overhead trolley wires on a car-free bus lanes for much of the route, but run off-wire through Castellon's charming historical centre. 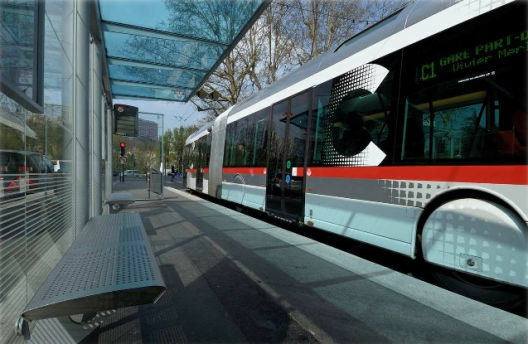 A new battery trolleybus BRT line will open in Rimini, Italy later this year. 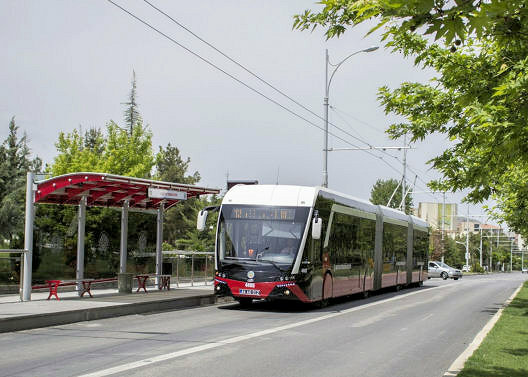 Cities expanding their use of battery trolleybuses include Zurich, Switzerland, which is also expanding its very extensive network of bus lanes - some of which meet BRT standards. After the 1973 oil shock, Zurich created a still unmatched network of exclusive transit lanes and signal priority for both trams and buses. Zurich is building new bus lanes, and improving older ones to get closer to its goal of never having transit passengers delayed by cars. Zurich now has the highest transit ridership in Europe, largely created with cans of paint and cleverly applied electronics controlling traffic lights. And traffic congestion is less of a problem than in most European cities. The climate emergency is far more serious than the oil supply crisis of the 1970s was, and cities like London must more than match Zurich's past efforts. Lyon, France, is also an interesting example. In recent years Lyon has built and upgraded bus lanes and BRT lines, added trolley wires to new routes, and upgraded to battery trolleybuses with considerable off-wire capabilities. Lyon's BRT and tram lines complement the metro network in the urban centre, and serve outlying areas that don't have metro lines. Trolleybus BRT lines are not isolated to Europe. Two of the three BRT lines in Beijing, China, have been converted to operate with battery trolleybuses. And San Francisco is constructing a BRT corridor on an existing trolleybus line. The oldest trolleybus BRT line has been carrying heavy passenger loads since 1995, in Quito, Ecuador. The capacity of BRT lines is similar to tram lines, even though the vehicles tend to be smaller; a line with 200 passenger buses arriving every six minutes has more capacity than a line with 300 passenger trams every ten minutes. Since BRT lines are less expensive and quicker to build than other forms of rapid transit, electric BRT is a crucial climate solution - we are in a climate emergency and humanity is running out of time. In the climate emergency, it is essential to know what really works at the necessary scale. 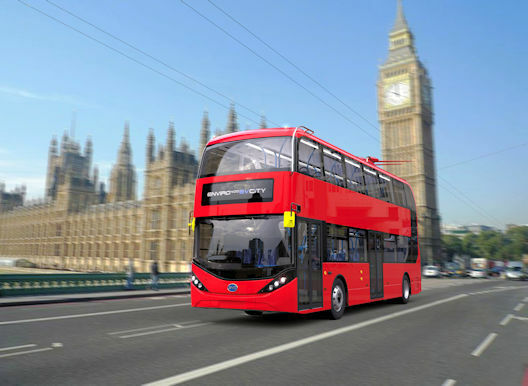 The London mayor's office touts hydrogen to power buses. Hydrogen cars, trucks and buses have been held up as a solution to the range limitations of battery electric vehicles for decades. But repeated tests of hydrogen transit buses have been dead ends. In my part of the world, the hydrogen bus trial in Whistler, Canada, saw the buses sold off at scrap value after only five years. Moreover, much of the present hydrogen supply is created from natural gas, and the carbon dioxide pollution is released into the atmosphere. Creating hydrogen from renewable electricity is much less efficient and more expensive than using the same electricity in battery trolleybuses, and liquid fuels created by combining hydrogen and carbon are even less efficient. For lighter duty routes, efficient battery buses with stationary charging work fine. A recent report from the Brussels-based Transport & Environment (T&E) research group, How to decarbonise European transport by 2050, states that: 'Given the much lower efficiencies of hydrogen but in particular electrofuels, these are optimally used only where no other alternatives exists.' This report calculates that hydrogen buses use 2.6 times as much energy as battery electric buses. T&E's 2018 report Electric buses arrive on time concludes that 'trolley buses with batteries or fast charging e-buses are the preferred solution to address range limitations'. The mayor's office also promotes biodiesel from waste materials. The supply of truly climate-friendly biodiesel (made from contaminated vegetable oil skimmed from sewer grease traps and the like) is tiny compared to the demand for diesel fuel. Much of the present biodiesel supply comes from food crops, and is more dangerous to climatic stability than conventional oil. And burning food when climate chaos is starting to disrupt agriculture does not seem like a bright idea. Biomethane made from waste organic material can be burnt in natural gas buses. But like biodiesel the climate friendly sources of organic material are extremely limited. Your kitchen scraps and left over chips don't produce much biomethane. The limited quantities of biomethane are best used to displace fossil natural gas in uses such as restaurant kitchens. Renewable electricity from wind, solar and other sources is rapidly becoming less expensive - and it can be scaled up quickly. Transport for London is already working to purchase renewable electricity and expand renewable generation in the UK. Biodiesel and biomethane are also not much better for air quality than conventional diesel. Acting on the climate emergency can produce much cleaner air with a switch to electricity. Local air pollution causes thousands of premature deaths every year in the UK, as well as contributing to widespread chronic illness in adults and children. All fossil fuel vehicles are more polluting than the manufacturers claim, not just Volkswagen's diesel machines, though accurate data is tough to come by. Cars, trucks and buses are the most dangerous sources of air pollution since exhaust fumes are released directly onto streets full of people. A few thousand deaths a year pales in comparison to the climate emergency, which threatens the futures of every younger person on the planet. But cleaner air is an important co-benefit of climate action. T&E calculates that when noise and air pollution costs are included, electric buses cost about the same as fossil fuel buses. When climate pollution is included, electric buses and bus lanes are a grand bargain. Battery trolleybuses charge their batteries off overhead trolley wires while moving, and operate like other battery electric buses off-wire, and can cover at least the same distance in a day as a diesel bus. And the overhead wires only need to cover between one-fifth and two-thirds of the route, so costs are not much more than burning diesel. Modern trolleybus poles connect and disconnect from the wires with a driver operated switch. Reconnecting is done at stops with plastic 'rooftops' to guide the connector onto the wire. If the driver has to lower the poles to go around construction, the driver just goes to the next stop that is equipped with â€œrooftopsâ€� and flicks a switch to reconnect. Many more, and better, bus lanes will be needed to meet the aspirations of the climate emergency declaration. A bus crawling along in traffic, or in a so-called bus lane jammed with taxis, does not use much energy. A bus using good quality transit lanes covers much more distance, will attract many more passengers, and will therefore use much more energy. I attended the 6th international e-bus conference in Solingen, Germany, in November and heard how the cities in the best position to quickly shift to electric buses on energy intensive routes are those that already have trolleybus wires in place. 'It's a no brainer ... To use electric buses which are powered with in motion charging,' said Erik Lenz of Kiepe Electric. 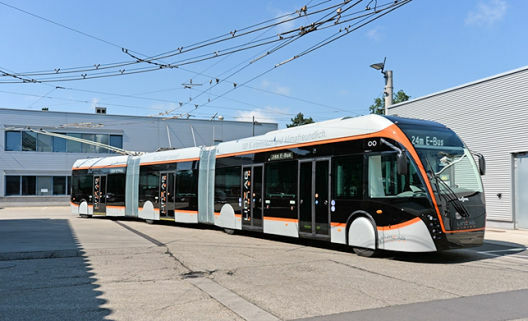 Solingen's transit agency has stopped ordering fossil fuel buses and is using their existing trolley wire network to charge battery trolleybuses. 'It is a very efficient system, and thatâ€™s why they went for it,' said Lenz. Solingen is aiming for 80 per cent electric buses within four years, and will phase out burning fossil fuels as older buses are replaced. Cities with existing trolleybus wire networks (such as Lyon; Vancouver; Seattle; San Francisco; Shanghai; Beijing; and over 300 other cities around the world) already have powerful charging systems in place for electric buses. Unfortunately, no UK cities kept their trolley bus systems. London and other UK cities switched from electric buses to 'modern' diesel buses, and removed their extensive trolley wire networks in the 1950s and 1960s. However, installing new trolley wires to create charging roads is not necessarily more expensive than installing many charging stations for the same number of buses. If the climate emergency declaration is taken seriously, there will be a major investment in charging infrastructure of some kind. Some cities are bringing the trolleybus back. For example Verona, Italy, closed its trolleybus system in 1975; it will have two new battery trolleybus lines in operation by 2021, with off-wire operation in the city centre. Experts from cities such as Berlin and Stockholm told the e-bus conference that different types of electric bus charging systems are required for different transit lines. Overnight charging works for smaller buses that don't travel far per day. Electric buses that stop and charge at fast chargers can have a role on moderately demanding lines. But the heavy lifting is best done by battery electric trolleybuses, which are the most practical technology for large buses on the busiest and most demanding routes. Battery trolleybuses can accelerate and climb hills faster than equivalent diesel buses, so on hilly routes they can be significantly faster. Using other types of electric buses on the most demanding routes would require buying and operating more buses, with each bus driving a shorter distance per day. With larger buses even the most powerful fast chargers often take longer than the time available at end points. This would be impractically expensive in large cities where land to park and charge buses is not readily available. In small cities, larger fleets of electric buses using stationary charging may be a reasonable choice. Regardless of the charging system chosen, the investment needed to switch to electric buses will be considerable. The UK's contracting system for buses will have to be eliminated or radically changed to make this investment in charging infrastructure possible - private companies are not going to invest hundreds of millions of pounds in charging systems if their contract is up in five years. Letting Margaret Thatcher block climate action from the grave would be a very sad joke. Cities that use a lot of double-decker buses, such as Berlin and London, face an extra challenge in electrifying their fleets. Large double-decker buses weigh a lot when full, and donâ€™t have as many tyres as an equivalent bendy bus. Adding large batteries would cause costly damage to roads, and it may be challenging to fit large batteries into existing bus designs. A promising solution is to add trolley poles to an existing double-decker bus design to allow usage on the most demanding routes; if the batteries can be charged while the bus is in motion the batteries can be smaller and lighter. Most historic UK trolleybuses were double-deckers, and there is no obvious obstacle to adding modern trolley poles to a modern electric double-decker bus. On very busy routes, the better option may be to switch to double articulated buses that can carry up to 220 people. Everyone knows that companies make exaggerated claims about their products. Electric bus manufacturers routinely base their claims for how far their electric buses can go between charges on ideal conditions. But real world performance with heavy passenger loads and power-hungry heat or air conditioning operating is a different matter. Unfortunately, the world's largest manufacturer of electric buses has been reportedly beset by 'poor performance' including driving ranges that fall short of company claims in the US, leading disappointed transit agencies to delay the transition off fossil fuels. But transit agencies everywhere can learn from European experience with what each type of electric bus can really do. 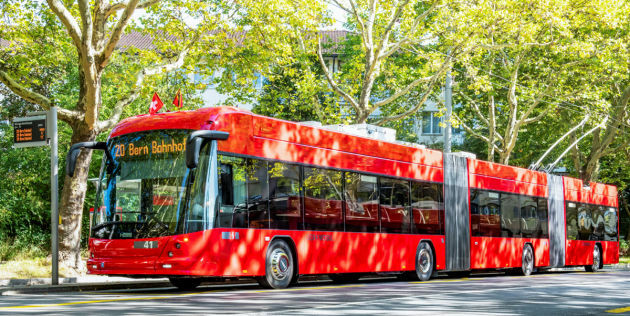 With battery trolleybuses there is no need to wait around for the battery industry to make improbable technical leaps â€“ while batteries getting cheaper they are still very heavy, and weight will likely still be a big issue a decade from now. T&E's electric bus report suggests increasing the allowable weight for electric buses so they can carry as many passengers as diesel buses. This is reasonable, but the cost of repairing damaged roads needs to be considered when comparing lighter battery trolleybuses to heavier electric buses with larger battery packs. Battery electric buses and battery trolleybuses are now becoming variations of the same product - and prices will come down as a result. Electrical equipment manufacturers ABB and Kiepe Electric both told the e-bus conference participants about how they use the same components in battery electric buses that charge only while stopped, and buses equipped with trolley poles. This means that as the volume of electric buses goes up, prices of all types of electric buses will come down with economies of scale. 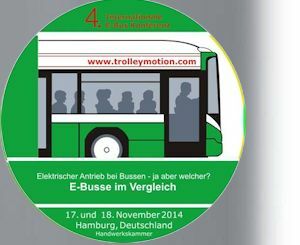 Trolley:motion, which is funded by the European Union, organised the e-bus conference. Their mission includes improving battery trolleybus technology, and bringing prices down by expanding the number of manufacturers offering trolley charging on their electric buses. Soon, Trolley:motion will be assisting with the conversion of an ordinary battery electric bus to a battery trolleybus capable of operating all day on very demanding routes. If this goes as expected, most bus manufactures should soon offer trolley poles as an option on their electric buses. If big cities, such as Berlin and London, step up and order thousands of battery trolleybuses it will bring prices down globally as the scale of production jumps to a new level. All major bus manufacturers are capable of producing battery trolleybuses, and will respond to demand from big customers. At the United Nations COP 24 climate conference in December, teenage school climate strike organiser Greta Thunberg demanded that adults start taking the climate emergency seriously â€œbecause we are facing an existential threat and there is no time to continue down this road of madnessâ€�. If adults listen to the climate scientists and wise teens, there will soon be many battery trolleybuses gliding quietly down bus lanes in the UK.